In our previous article, we established that the vast majority of government purchases are not regulated by the EU directive but can be regulated on a national level. When it comes to the risk of corruption or wasting money, national legislation should, therefore, play a key role. But does it? Let’s take a look at Czechia (the Czech Republic), and dig a bit deeper into the anatomy of its spending. In other words, 61% of purchases by the Czech government and its municipalities did not follow procurement regulation — either they were deemed too small or fulfilled any number of other exceptions. Let’s take a look precisely where this is happening. In our project zIndex.cz, for benchmarking Czech public authorities, we took accounting data for each city, ministry, and region in the country and cross-referenced them with the volume of public tenders. First, we confirmed previous estimates: the average authority indeed makes 2/3 of its purchases outside of procurement. All in all, we found out that relatively narrow groups of authorities tend to have great spending outside the law. Could this be a measurement error? Or is there some rational explanation why these institutions spend huge sums of money? We dug even deeper to find out. When we participated in the audit of several Czech ministries and their organizations, we came up with an idea of how to investigate this spending outside public procurement. We proposed to cross-reference their invoices with our procurement database. This approach flagged a list of invoices, for which we saw no prior public procurement explaining the invoiced volume. Was this bypassing the law? Our auditors followed up and asked ministries about the invoices, which gave us a brand new perspective on the 63% which our government spends outside public procurement: the majority of dubious invoices followed from old contracts, signed before 2006 when the registry of acquisition came into effect. In fact, most of the contracts were signed in the 90s, which was surprising given that they were based on IT or PR services. Even though the industries evolved massively, ministries saw no need to re-run the tenders and were happy to receive services from original suppliers, amending their contract multiple times. Here’s a summary of other findings below. It is our opinion that old contract amendments have not been in line with procurement law. Our audit however ended solely with a recommendation to terminate these contracts. The finding itself that multiple ministries have kept “dinosaur” contracts has shed some light on the issue of figuring out where this money goes. As we expected, it was the small contracts. We found tens of thousands of contracts valued at up to 75 000 EUR (the national threshold), typically for ordering drugs and medical supplies. However, at closer inspection, we found that a disturbing number of them went to a small number of companies, including a few Czech shell companies but also branches of multinational corporates such as Phoenix, Walgreens Boots Alliance or Boston Scientific Group. The contract volumes were way above any national or EU threshold, counting in millions of euros and all awarded directly without competition as “below threshold” contracts. After our government representatives assured us this is in line with Czech law (as these are many small purchases), we filed a question with the European Commission. Finally, this resulted in the commission mandating the Czech government to change the law accordingly. Despite this now being three months ago, we are still waiting for the change to occur :). So, what is the 61% of Czech purchases unregulated by any procurement law? The surprising answer is that only a fraction is actual below threshold contracts. In our zIndex rating, some hospitals managed to spend 50% of money through public procurement, some cities even 80% (that’s 30% above average in both groups). If the authorities are willing to use competitive procedures and not avoid the law, they can easily end up spending the majority of the money through public procurement — with higher transparency and potential savings. 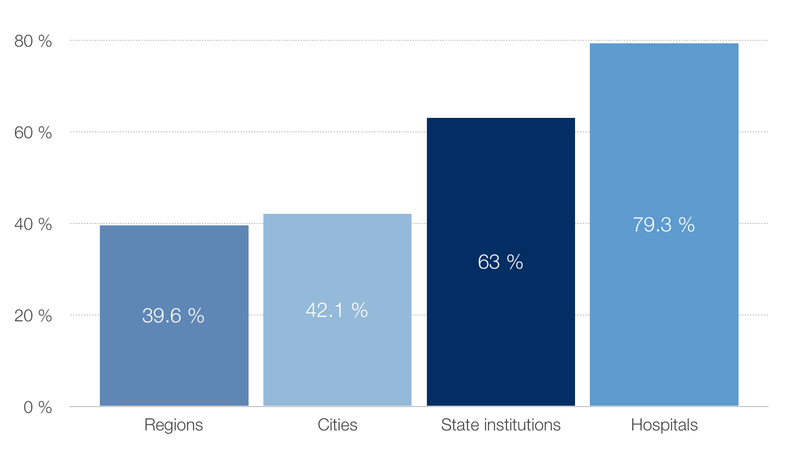 That’s what also our results suggest — in  we document that authorities better ranked by zIndex save 5% in each tender.